It’s the season of giving, and Facebook has just given nonprofits a new way to collect donations. Facebook launched a “Donate” button, which will appear next to posts in the news feed that are shared by participating nonprofits, as well as at the top of those nonprofit’s Facebook Pages. When people click the “Donate Now” call-to-action, they have the ability to choose an amount, enter their payment information and donate directly from the world's most popular social network. Plus, the posts with the Donate call-to-action can also be shared, which can help to increase both visibility and donations for nonprofit organizations. According to the Facebook announcement, the social network decided to launch the donate button after seeing positive results from its partnership with the Red Cross earlier this year. The social network notes that it has already partnered with a few nonprofits, such as WWF, St. Jude Children’s Research Hospital and Boys & Girls Clubs of America. 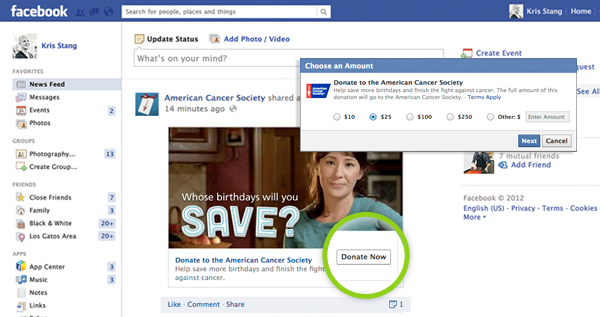 That said, Facebook says that it will make the Donate feature available to more organizations soon. Nonprofits that are interested can fill out the “Donate interest form,” which can be found in the Facebook Help Center.